Peter Pan: The first superhero | when is a party not a party? The story of Peter Pan remains as rousing now as when it first appeared. When “Peter Pan Live!” airs on NBC this Thursday night, it will mark 110 years to the month that the boy who wouldn’t grow up first flew through the window of our collective consciousness in the classic play “Peter Pan” by J.M. Barrie (1860-1937). He’s never really disappeared. And thanks to the feature-film “Pan” being released next summer, with Hugh Jackman as Peter’s pirate foe, and “Finding Neverland,” a new musical with Matthew Morrison and Kelsey Grammer that is based on a 2004 film and coming to Broadway next year, the latest burst of Peter Pan-demonium is sure to continue. Peter Pan has crowed and flown in every entertainment medium—most of which weren’t even in existence in 1904—and portraying his magical adventures has always stretched the limits of the available technology, from stage to film (both “live” and animated) to a series of television spectacles starting in 1955 that continues six decades later. Peter Pan was the first superhero, and like Tarzan, Superman and Batman he is an orphan with exceptional abilities. Barrie introduced the Peter Pan character in his rather obscure 1902 book, “The Little White Bird; or, Adventures in Kensington Gardens,” which contains the closest thing to an origin story that the author ever provided: Peter is a newborn boy who escapes to one of London’s more fashionable parks, where he is essentially taught how to fly by the birds and the fairies. Within two years, Peter had taken his familiar adolescent form and Barrie had invented the rest of the cast of characters—including the Darling family (most notably Peter’s leading lady, for whom Barrie invented the name “Wendy”); the Lost Boys; Peter’s gal-pal fairy companion, Tinker Bell, and his nemesis, Captain Hook; as well as Hook’s ship full of cutthroats and scurvy knaves. Barrie also fleshed out the geography of Peter’s home base, “the Never Never Land” where mermaids are real but parents are imaginary. In his description, various dominions are dominated, respectively, by Indians, pirates, young people in animal costumes, and intelligent beasts; the island is rather literally a blueprint for Disneyland. Though Barrie was born in Scotland and his most famous character in England, over the years Peter Pan has become increasingly American (though Allison Williams apparently will be bucking that trend when she fills Peter’s famous green tights on NBC—she’s practicing the queen’s English). In his cinematic debut, a 1924 Hollywood silent film starring Betty Bronson, the Lost Boys sing “My Country ’Tis of Thee” as Hook gives the order to execute them. Peter was then born anew as a Yank (without any British accent) in three different musical treatments in the early years of the American baby boom. The first, in 1950, was a somewhat intellectual treatment with music and words by Leonard Bernstein, wherein Wendy’s lullaby to the Lost Boys is a contemplation of reincarnation. Then came the animated Disney version of 1953 (with songs by Sammy Fain and Sammy Cahn), in which Peter, for the first time, was played by an actual boy (on the soundtrack at least) as opposed to an adult female; the cartoon Hook (voiced by Hans Conreid) is considerably more menacing than his later Broadway counterpart and therefore the conflict is more dramatic. But much of the tension derives from the romantic quadrangle between Peter, Wendy, the Indian princess Tiger Lilly and a rather grown-up, Marilyn Monroe-like Tinker Bell—even the mermaids are rivals for Peter’s masculine attention. 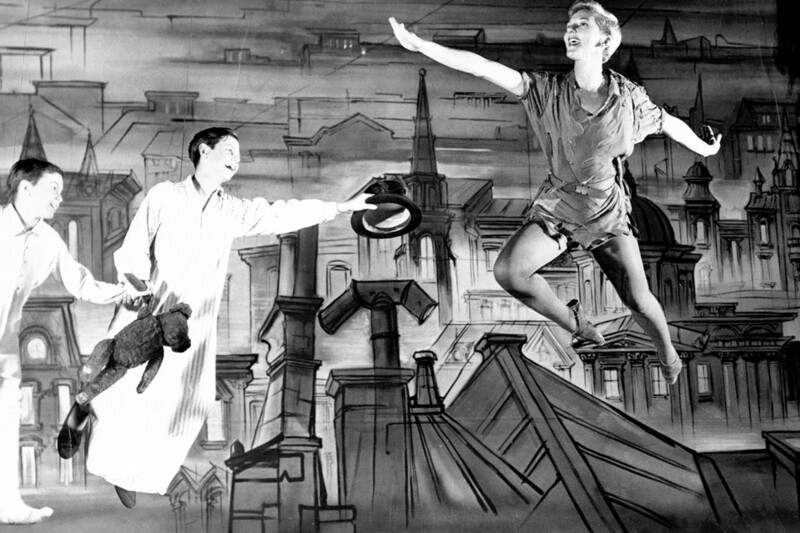 But the “Peter Pan” that was repeatedly televised and that multiple generations have grown up with thanks to various stage revivals with other casts is the musical version first seen on Broadway in 1954, with a score by Moose Charlap (father of the celebrated jazz pianist Bill Charlap) and Carolyn Leigh, plus additional songs (including “Never Never Land”) by Jule Styne, Betty Comden, and Adolph Green. This is the one with the richest score and the most iconic portrayals, especially with Mary Martin as the androgynous title character and comic Cyril Ritchard as the dandified villain. (Hook is sometimes described as an “Eton man,” but he’s also an eaten man, in the sense that he is consumed by a crocodile in the finale.) Although this treatment is fairly faithful to Barrie’s original, the story here is mostly played for laughs—especially Ritchard’s prissy pirate—and the whole production is more burlesque than adventure. Subsequent Pans have sought to restore at least some of the dramatic gravitas to the familiar story, starting with the 1991 “Hook,” Steven Spielberg’s utterly charmless 20-ton turkey of a sequel. In 2002, “Peter Pan: A Musical Adventure” recast the story in the mold of such modish musical fantasies as “The Phantom of the Opera” and “Jekyll & Hyde.” In 2003, a new theatrical film version of “Peter Pan” expertly presented the magic of Peter and Wendy in the technology of digital CGI effects, thus updating the story for the age of Harry Potter. In 2004, two different kinds of back story appeared: the novel “Peter and the Starcatchers” (and subsequent play both on Broadway and off) was a prequel depicting the earlier years of Pan and Hook, while the film “Finding Neverland” told the story behind the story—how Barrie (played by Johnny Depp) came to conceive the characters. Peter’s attractions seem ageless. In fact, the only individuals who claim to disapprove of him are those curmudgeonly pseudo-psychologists who invented something called “Peter Pan Syndrome”—as if that were a bad thing—with the obvious motivation of revenge on everybody who has ever had more fun than they did. (Whenever the word “syndrome” is attached to something, it is rarely a compliment.) They are truly the descendants not necessarily of Hook, but of Mr. Darling, whose only “passion,” Barrie tells us, is “for being exactly like his neighbors.” Peter, on the other hand, has a passion for virtually everything. “ I am youth! I am joy! I am freedom!” he shouts. Even death itself holds no terror for him. “To die will be an awfully big adventure,” he tells us. And yet aging and then dying are perhaps the only adventures that Peter Pan will never know.